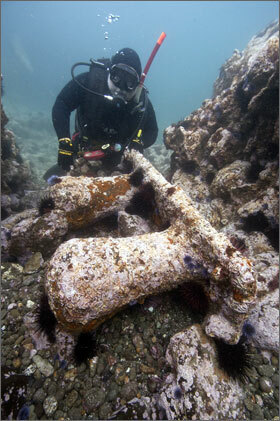 Today, Robert Schwemmer, maritime archaeologist for NOAA's Office of National Marine Sanctuaries, presented a scientific paper on the George E. Billings history and its discovery in February 2011 at the eighth California Islands Symposium in Ventura, Calif. The Billings, a five-masted schooner built in 1903 by Halls Bros. of Port Blakeley, Wash., hauled lumber from the Northwest to Hawaii, Mexico, South America, Australia and southern California. After decades servicing the lumber trade it was converted into a sport-fishing barge. In 1941, the owner decided to scuttle the aging vessel off the coast of Santa Barbara Island. "The discovery of the Billings is a result of excellent collaboration with the local community," Schwemmer said. "Now we can write the final chapter of not only the largest, but the last sailing vessel built by the Hall Bros. during their 30-year career of designing some of the finest ships sailing the Pacific." More than 150 historic ship and aircraft have been reported lost in sanctuary and park waters, with 30 having been located and surveyed. The wreck sites are protected under state and federal law, and it is illegal to disturb or damage any archaeological sites in sanctuary and park boundaries. The Billings shipwreck remains are owned by the State of California and managed by the California State Lands Commission. "Channel Islands National Marine Sanctuary and Channel Islands National Park are a world destination for sport diving," said Chris Mobley, sanctuary superintendent. "For years, divers have shared new discoveries with both federal agencies and we commend them for their spirit of stewardship so these historic resources can be surveyed and shared with the American public." Channel Islands National Marine Sanctuary was designated in 1980 to protect marine resources surrounding San Miguel, Santa Rosa, Santa Cruz, Anacapa and Santa Barbara islands. The sanctuary spans approximately 1,470 square miles, extending from island shorelines to six miles offshore, and encompasses a rich diversity of marine life, habitats and historical and cultural resources.